My take: Julie Crawford, recent graduate of Smith College, didn’t want to go home, get married and live the life her parents intended for her. She wanted to follow her dream to Hollywood to become a screenplay writer. Her parents agreed to one year and then she had to come home. Julie landed an office job at Selznick International Pictures (SIP) which was starting production of Gone With The Wind. That job lasted one day – she was fired by Selznick himself. Not to worry, though. She landed a job as assistant to Carole Lombard, formerly of Fort Wayne, Indiana (Julie’s hometown), queen of screwball comedies, and soon-to-be wife of Clark Gable. Eventually Carole helped Julie make connections in the screenwriting world. Julie met Andy Weinstein, an assistant producer, on her one day at SIP and was instantly attracted to him. Their relationship grew as filming of GWTW progressed and provided a parallel storyline that I enjoyed. Andy was under pressure to keep things going smoothly on the set while at the same time he felt pressure from the looming Nazi threat in Europe. He felt he should be doing something to help his relatives in Berlin instead of making movies in Hollywood. I really enjoyed A Touch of Stardust. Reading it was like watching a movie from the ’40s. I was immersed in many aspects of making GWTW. From casting to the actual filming to the premier in Atlanta – I felt like I had a front row seat to it all. I liked the Julie/Andy storyline but I thought the real star of the book was Carole Lombard. Alcott made her leap off the page every time she appeared. Her relationship with Clark Gable was so endearing and her unapologetic ways and colorful language made her larger than life. If you’re a fan of Hollywood, Gone With The Wind, or stories about following a dream I think you’ll enjoy A Touch of Stardust. I sure did! I think this one sounds like a great book to fit between some of my mysteries. A palate cleanser of a sort. I’m going to check out the audio. I bet it’d be a wonderful audio! That sounds terrific! Is it nonfiction? 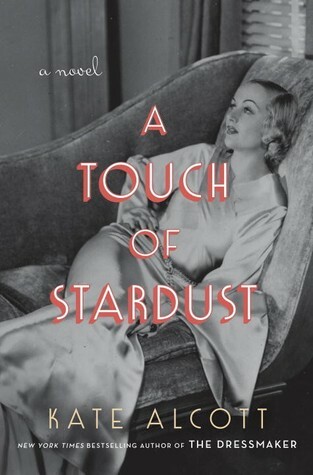 Kathy, A Touch of Stardust is historical fiction. I really enjoyed it! I have been ogling this one for a while…I definitely love the sound of it. Thanks for sharing your take. Sounds like a great read. I have it on my tbr list on Goodreads. Thanks for sharing your thoughts on this book. I love movies from this time period and I love the idea of getting an idea of what’s going on behind the scenes. This sounds like such an interesting and entertaining read. I have been looking forward to this one too. Sounds like a good read and you enjoyed it! Oh, I love old Hollywood. Off to see of the library has it! I’m glad to see you liked this one. I have it in audio. Gone With The Wind – book and movie – are favorites of mine, so I was hoping this would be good.